enjoy the terraces and verandas, and of course sitting still and listening to the birdsong and the sound of silence, to nourish your soul. 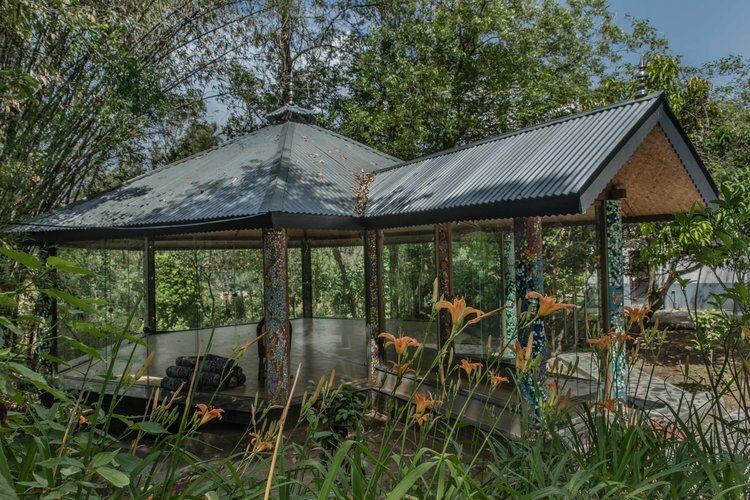 The Mirage Yoga Retreat is the ideal environment in which to host a wide variety of group retreats, including Yoga, Meditation and Spiritual Practices. Our harmonious residence, at one with nature and spirit, profoundly enhances the ease of success for your retreat experience. As a group leader, our Group Retreat Program is the perfect solution for you to host a group event, while personally enjoying your own holiday in India. We'll assist you in creating the right package for your group, and in coordinating travel, bookings, reservations and schedules for your activities. Before considering the program of optional activities, please know that we are here to answer your questions and help you through the entire process of organising your retreat. Sobha Singh was the Punjabi artist who painted the only accepted images of all the Sikh Gurus. The Andretta Artist Village is famous for its Norah's Centre for Arts, Andretta Pottery and Craft Society (they sell earthenware to Fab India in Delhi.) We recommend visits to Norah's Mud House and Sir Sobha Singh Art Gallery. There is a nominal charge for the Art Gallery. We can arrange pottery sessions at Andretta Pottery, where those who make a bowl, cup, or other ceramic object they'd like to keep, can have them glazed, fired and posted home, at a later date. Prices on request. 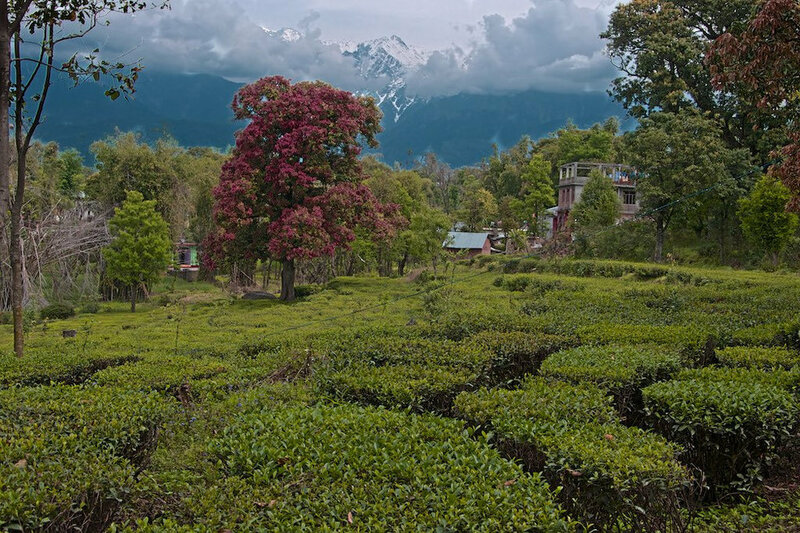 A little further afield, on the outskirts of Palampur is the Wha Tea Estate, where we can arrange a tour for guests to witness the whole tea growing, picking and manufacturing process from plant to cup. The Wha tea estate tour takes an hour to walk through the estate and learn about the manufacturing process, which is very educational. Perfect for Adrenalin junkies, we can arrange tandem paragliding flights can with expert instructors and pilots at the world famous Bir-Billing site. Bir is a 40 minute scenic drive from The Mirage through the Shivalik hills. A tandem flight from Billing (2700ft) out over the Kangra Valley…awesome! Tandem flights cost 2500/-pp. Several decent restaurants are on location for lunch. Bir also has the Deer Park Institute, dedicated to the study of Religion on the Sub- Continent. Funded by H.H. The Dalai Lama, they offer many programs on many subjects. It’ll depend on timing as to whether or not there’ll be something to attend at short notice. The Shiva Mandir at Baijnath, reputedly the oldest Shiva Mandir in northern India (9thC). Tenzin Palmo’s Nunnery and Temple about 20 mins from The Mirage. A lovely peaceful place. Born in 1943, Diane Perry, now Jetsunma Tenzin Palmo, is an amazing woman who came onto her Buddhist path while in the UK at 18yrs of age, and moved to India aged 20, to work & study under Freda Bedi, another extraordinary English woman who lived most of her life in India, became a Buddhist Nun, & who had an incredible influence in the propagation of Tibetan Buddhism in the West. There are books on both women in the local market. Tenzin Palmo spent 12 yrs living in a mountain cave, 3 of them in strict retreat, on her journey to becoming a yogini. She’s often here at her home at the nunnery and is very approachable, but very busy too. A meeting can be arranged with notice. The Tibetan Norbulingka Institute at Palampur, 40 minutes drive, its gardens, workshops, cafes and boutique are a serene alternative to McLeod Ganj. A group preferring to shop at McCleod Ganj could split and spend the day there. The Kangra Valley Railway, a narrow gauge railway that runs between Pathankot and Jogindernagar. It serves local and more remote communities, and, as such, is a great way to see the rural areas away from the main roads. It's cheap & a great way to go to Kangra to visit the famous & impressive fort there (which offers a very well done audio tour). It stops at Panch Rukhi, The Mirage’s most local town. There are several departures each day. Prices on request. Our recommendation is to send guests on the train to Kangra and have them return by mini bus, which can be sent across to pick them up. Alternatively, guests can travel to Kangra by train on their final day and continue the journey home by mini-bus. The Mirage works closely with an HPTD Accredited regional inbound & outbound transport operator, and we are happy to arrange your transport for you, should you require assistance.